When you feel your best, you live your best!! Create the SPARK your body and mind needs to thrive. What's the experience your body needs to receive to to show up to life in a renewed, refreshed and empowered way? After working with hundreds of clients all around the country from overworked entrepreneurs, athletes, to busy home moms, I've seen it all and I know just what you need to rejuvenate your body, thrive beyond the stress and live your best self. But there is something you need to know! I'm not your average massage therapist and yoga instructor. I've devoted years to mastering my tradeI'm more than an in-tuned massage therapist, an out the box yoga instructor, and there is a reason why retreat leaders being me in for their BIG events. After years, trainings and working will clients all round the country, of people invested over $40,000 and I've invested years, to I'm also BodyMind Coach and Embodiment Specialist. I infuse the best of therapeutic bodywork, aspects of yoga, mindfulness, and BodyMind Coaching into a personalized session to create the results that you need to thrive in the day-to-day. "Fidel is truly a gift to the world! I've never had coach or therapist listen to my needs and actually follow through with every little detail, accustomed just to me! He's professional, respectful, genuine, and the whole experience was completely unique! I cannot recommend him enough." I'm more that a coach, massage therapist and private Yoga Instructor! When you feel your best, you do your best. Through a powerful BodyMind Coaching conversation, we work together to breakthrough the root of the stress and how it's showing up in your body. We get clear on the goal you have and and the goals you have. Then we spark the feeling with a one-of-a-kind customized session that combines the best of mindfulness and relaxation practices into a unique session infused with elements of yoga, breath work, meditation, and an array of hands on body-mind approaches to align your vision and ground it in your body. IT'S SUPER HEALING! You're guided through meditation, breath work and hands on modalities to change the tension patterns and spark the mental clarity and creativity. The fusion experience trains the mind to be still and and let go by releasing tension in your body and maximizing rejuvenation. You're guided through meditation, breath work and hands on modalities to change the tension patterns. "I have been living with Stage IV breast cancer and constant pain for 10 months. Two sessions with Fidel and my symptoms are relieved. I recommend his fusion services to everyone." Whether you’ve been on the yoga mat for 10 days or 10 years, we will customize the hour the meet you anywhere in your yoga practice. You'll get you the personalized instruction and support for your health, body type and lifestyle. Powerful body-mind therapy that combines rhythmic movement, series of assisted Yogic adjustments, deep passive stretches along with hands-on techniques. It enhances strength and flexibility, relaxes sore or tense muscles, and helps to increase range of motion. Are you working through the pain, stress and overwhelm, but finding it difficult to press through? Discovery and breakthrough session to explore your goals, where you’re feeling stuck, and the health and wellness improvements you’d like to shift. 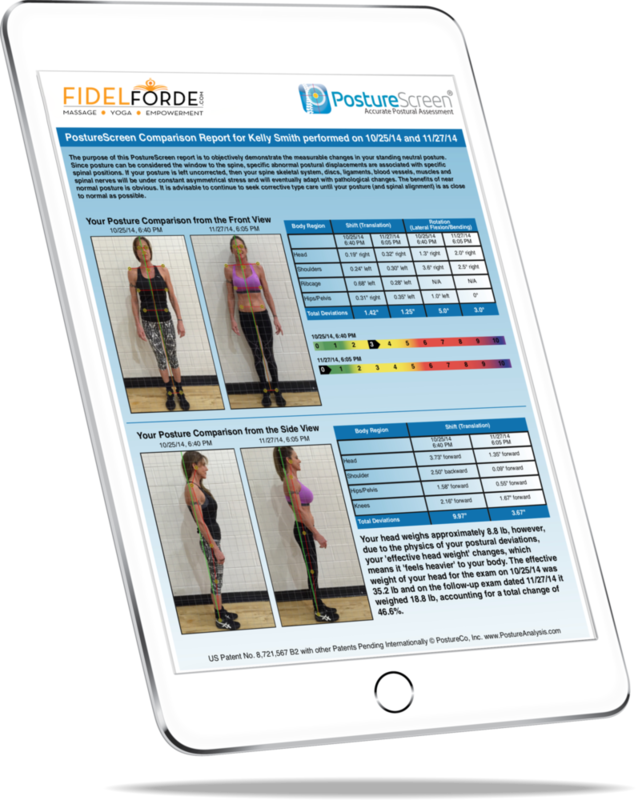 We create a 360 digital posture and movement analysis to establish a baseline, identify muscle imbalances, and examine the impact your current lifestyle is having on your body and take the best approach to move forward. 90 minute one-to-one session customized to what you need in that moment to move through your stress and cultivate the physically rejuvenation. You'll receive a day to day approach and routines to improving your posture for the weeks ahead. If you feel like your body needs to be renewed on the deepest levels, this extended session is enhanced by including a full body herbal and essential oil infusions to restore the body inside out. It's detoxifying treatment surrounded with warm steam herbal infusions to restore the body, relieve sore muscle and joint fatigue, extra water weight, toxins in the body, and your stress all in one. You’ll burn up to 600 calories and eliminate excess fluids in just one session. Not only does this healing treatments help with sore joints, arthritis relief, fibromyalgia and total relaxation, nut will also help with weight loss, cellulite and lymphatic drainage. This would help, let's talk! A Slideshow is a great way to showcase screenshots of your product or photos related to your products. Just to let you know, I'm pretty radical about providing the highest level of support and quality of work for my clients. I only take on 2-3 new clients a month in this capacity. Please complete the questionnaire below and we'll connect soon so to make sure that we are a good fit for one another and that I can provide what you are looking for. I can't wait, contact me soon!